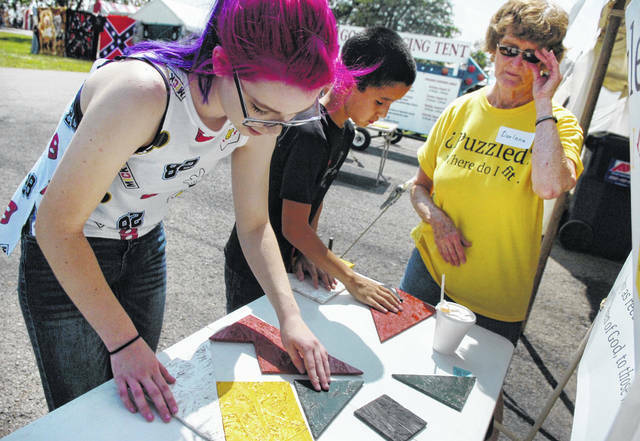 Gracie Breidenbach (left), of Bluffton, and her brother Owen, try to put together a puzzle with volunteer Darlene Hess, of Lima, during Children Choosing Christ at last year’s fair. WHEN: Shows at 7 p.m.
• Children Choosing Christ (children’s activities) is 10:30 a.m. to 1:30 p.m. Saturday, Aug. 18, Monday, Aug. 20, and Saturday, Aug. 25. • A non-denominational worship service begins at 10:30 a.m. Sunday, Aug. 19. • A Golden Age Day Party begins at 11 a.m. Thursday, Aug. 23. LIMA — The Gospel Singing Tent is home to free concerts nightly at the fair. “We’ve got a great line up,” said Gene Derringer, secretary and treasurer for the Gospel Singing Tent. Jimmy Fortune, a Statler Brother group singer for 21 years, is the featured artist, performing Saturday, Aug. 18. Derringer is expecting a big crowd at the tent to see Fortune perform. Fortune sings country and gospel music. “If we don’t get 1,000 people, I’m going to be disappointed,” Derringer said. He said many of the bands performing at the tent this year are well known and would otherwise fetch a large ticket price. Many people are in tight spots financially and wouldn’t be able to afford to see someone like Fortune perform elsewhere. The only cost to attend the performances at the gospel tent is the Allen County Fair admission.